The Capability Model and the Value Stream are important tools to an organization for different reasons. The Capability Model, a model of an organization’s ability to successfully perform a business activity, helps an organization understand the capabilities developed through the execution of the business model and makes the executive decision-making process more seamless. Likewise, Value Stream Mapping, a Lean tool for capturing an organization’s process to create a product, helps management visualize the processes that add value directly to the customer and those that do not. However, the effort to capture an organization’s Capability Model and Value Stream can be quite daunting. It requires significant time commitment from staff, dollar commitment of external consultants, or a combination of both. When using the Capability Model to create Value Streams, firms are often forced to use Non-Traditional Value Streams due to the administrative nature of business processes. The purpose of the Traditional Value Stream is for managers to see the flow of value throughout process of manufacturing a product. However, it has become popular to apply Value Streams to non-manufacturing oriented processes, such as administrative processes found in services organizations. Traditional Value Streams allow managers to identify sources of waste in order to develop an improvement plan to reduce waste and get products to market faster. Quantitative data are factored into the determination of waste, including traditional lean concepts of elapsed, queue, lead, cycle, and takt times. Non-Traditional Value Streams on the other hand are used to reduce waste in order to control costs, rather than reduce the time a product can go to market. This differs from manufacturing and production in that they involve much more of human factor than production processes, and gathering process time data is much harder and is often more subjective than objective. Also, some processes are required by regulation or governance and are classified as business value added, a concept rarely used in manufacturing. The primary goal of both Value Streams is to reduce waste, but the methods to attain this goal can vary substantially. 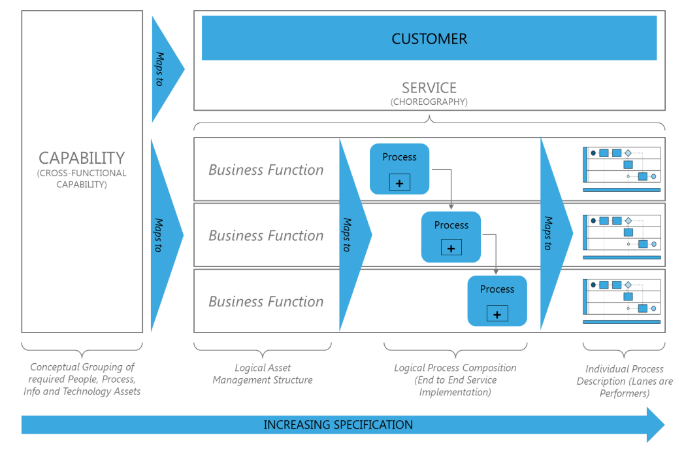 The Capability Model is developed to align technological needs of the organization and is aligned directly to ongoing business processes as they relate to strategy, whereas the Value Stream is often developed once an organization develops atrophy and needs to identify waste in order to cut non-value added processes. The Capability Model is a good artifact to use when creating value streams for the purpose of organizational transformation because Capability Model development is often an ongoing effort executed by an organization’s technology teams, more specifically the Enterprise Architecture team, prior to development of the Value Stream, which usually occurs when the organizational product reaches maturity. Determine the organization’s product(s), customers, and key activities required to make that product. Review the organization’s Capability Model and extract all functional and sub-functional capabilities aligned to the development of the product. Categorize all functional and sub-functional processes to determine which processes add value to the end customer(s) and dissociate those that do not add value to the end customer(s). Categorize and align all selected functional and sub-functional processes into business functions. These will become value stages. Align supporting capabilities for each value stage (supporting capabilities may be non-value added.